August was an amazing month for offshore fishing in New Smyrna Beach. Taking a quick cruise to the Atlantic Gulf Stream or the local reefs and wrecks produced a steady bite for its visitors. 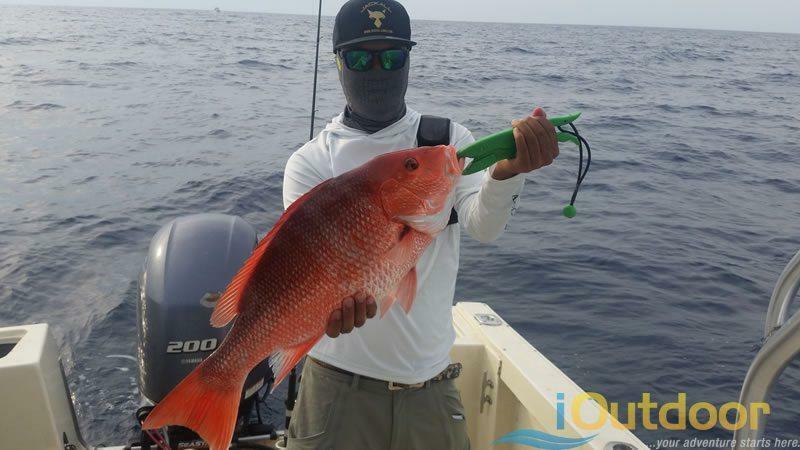 August was also the month that Red Snapper Season opened up for several weekends. Ponce Inlet Red Snapper Fishing was one of the best experiences here in North Florida along the east coast. Just south of Daytona Beach, you will find the entrance to the great Atlantic Ocean. While cruising through the intercoastal waterways to get there, enjoy the sights and wonders of North Florida. As you travel out of Ponce Inlet make sure you capture Florida’s tallest lighthouse as the sun breaks the horizon. Our local experts have years of experience cruising these waters and getting out to the local reefs for an abundance of species. 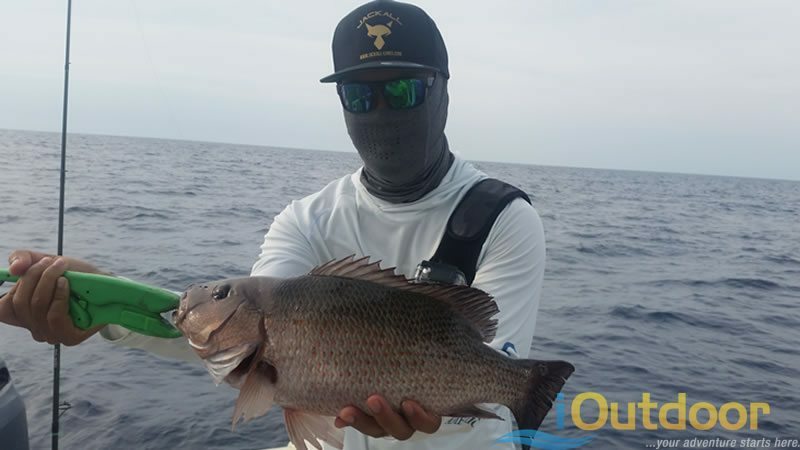 Some of our experts have learned a variety of techniques including inshore fishing and offshore fishing. When the weather gets rough, you can always come in and catch some great species on lighter tackle. Ponce Inlet deep sea Fishing has been where it is at though when the weather permits. Captain Brad Kayholm had the pleasure of fishing with Ariel and Tai. They were traveling from California and Japan to do business at a convention. It was a fun morning with the owners of Jackall Lures this summer. The fish were all fired up and ready to be caught. Ponce Inlet and New Smyrna Beach gives access to some of the best waters to catch Red Snapper and Mango Snapper. Sometimes when you go out you come across other species that can change the plans or direction of your fishing adventure on a Ponce Inlet snapper fishing trip. Ariel and Tai wanted to catch mango and red snapper. They got the mango snapper all fired up on the local reef and started reeling them in. It was awesome to have a school of great fish below the boat. Sometimes when you fire up a school and you put out bait and get the water chummed up, you happen to acquire some unwanted guests. Tai was looking for a good fight and he sure got one. As they were reeling in a mango snapper left and right, they wanted to go for something bigger. Chunking out bigger bait and letting it get to the bottom, it was not long until something picked it up. Tai was in for a long 20 minute fight that he actually had to have Aerial assist him with. The tax men were in town and they brought one to the boat. 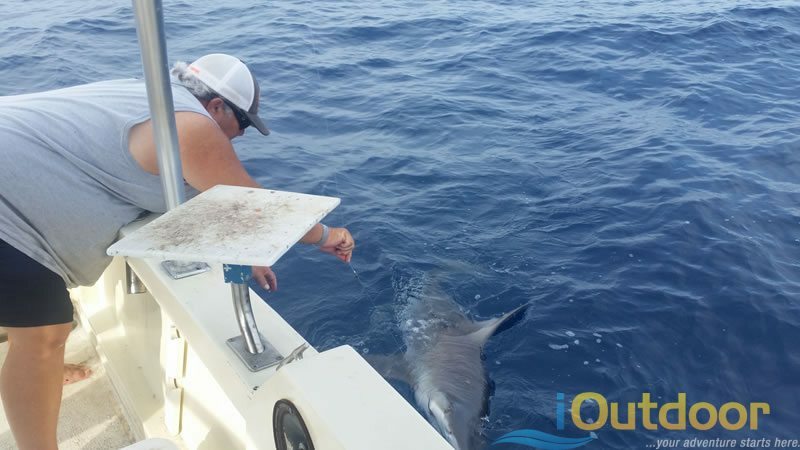 They caught a 7 foot, roughly 200 pound reef shark. It was an awesome fight. You just never know what you will catch on a New Smyrna Beach Fishing Charter. When you bottom fish like such, you will always encounter sharks whether you are catching them or they steal your struggling fish you just hooked. After getting taxed as they call it, the bite slowed down. After some time, the red snapper moved in. Ariel and Tai had a lot of fun catching several of them before the bite shut off. It was not long after the bite shut down that we decided to move inshore in order to catch a Red Fish. Unfortunately this trip was on the weekend and the red fish were lock jawed. Captain Brad had an awesome time with Ariel and Tai. They are looking forward to getting back on the water next time they visit Florida. You truly can’t beat what this beautiful area of Florida can offer you. Don’t miss out on your adventure in search for your inshore or offshore species of your dreams. New Smyrna Beach can most certainly accomplish your goals and dreams right here in Florida. We can’t wait to see you on the water next time! If you enjoyed this post about Ponce Inlet Snapper Fishing, you might also enjoy our Fishing reports. Don’t forget to follow us on Facebook, Pinterest, Twitter and Instagram.